It was a Wednesday, like most Wednesdays, quiet and normal. Midmorning Mary and I had made the 50-mile trip to Murray from Clinton to pick up my Compaq computer. My beloved elderly desktop computer had stopped working after a power outage. I confess that (despite my wife's nagging) I had backed up nothing to the cloud (or anywhere else.) So getting it going again was important. Office Depot, after 5 days finally admitted that they could not fix my system because they didn't have the right repair equipment in their store. This was the nearest Office Depot to us. Problem solved when I researched and found a small business that specialized in computer repairs in this college town of Murray State University. By 1:00 the genius at the computer store secured my computer and saved my data and files. Next on the agenda when traveling so far from home was a food supply run to the regional Walmart. At the door, Mary said, "We need soup and coffee creamer. You go after the soup and I will get the creamer." Looking at all the new inventory in the store, Mary stepped back a little, looked me with that look, and after moment issued her normal command when are out in public: "Try not to scare the people or get in trouble with the Walmart!" Looking a little sheepish, I answered, "Of course I always behave in Walmart." I heard her mumble as she pushed her grocery cart away "Don't count anything or ask any questions." Freed at last from her doubt, I proceeded to the soup section. As I passed the breakfast food section, I remembered the last time I had gotten in trouble in Walmart world when store management, with security for backup had ordered me out of the store. I had a moment when the cereal inventory caught my fascination. With my camera in hand I started taking up close photos of cereal box art work. While I was counting the exact number of different cereal products (83!) I was confronted by Walmart management and told to cease my actions and vacate the building. Somehow, they saw me a corporate spy. What nonsense. I was just interested in the cereal boxes as an example of corporate America relating to consumer America. Oh well, that was then and now was now, There was no way I would make that mistake again. Grabbing five cans of Progresso vegetable soup I moved the cart down the aisle. It didn't take long for trouble to find me. Just as I was preparing to leave the soup section for the checkout area, my path was blocked as I turned the corner to leave the soup behind. Wham! I came face to face with what passes in West Kentucky as Future Shock. 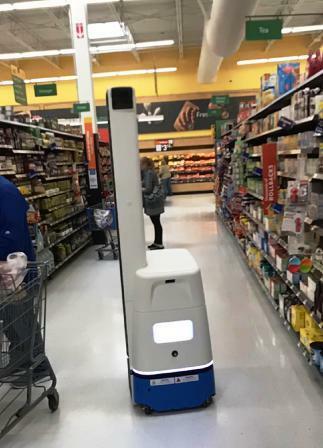 Standing cart to cart, toe to toe, face to face was a six foot tall robot directly in my path. At that moment, I forgot the real world around me and instead became focused on this marriage of computer and cart platform. It moved toward me. I backed up to give it room. Putting my hand on its 10" x 18" monitor screen, I said, "Computer: state your function." 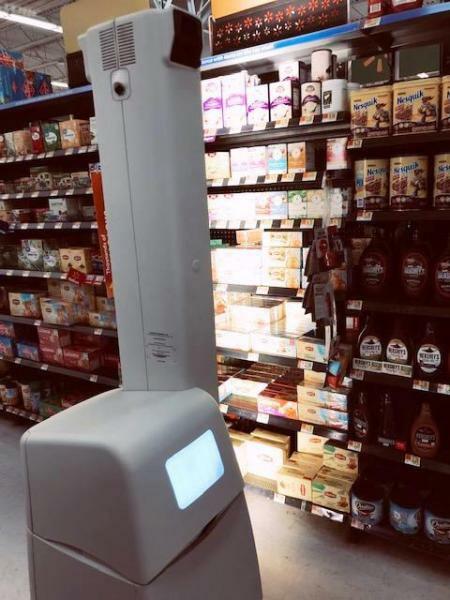 Unaware of my presence, the robot turned toward the row of soup cans and proceeded to shine a light over the inventory. It was weird watching a bright light (or maybe it was some sort of alien ray gun at work.) Quickly, my mind went through the drill of problem solving and overthinking the situation. Clearly it was not human. Check. Maybe an invisible alien life form that only I could see since no else bothered to upset at this machine? Its ray gun captured the image of every can. Could canned soup be of nourishment for aliens as well as humans? Maybe it had come in peace and wanted only the cans to digest? I blocked its way and once again tried to exert some control over the situation. "Computer, state your function." The life form instead of answering me stopped moving and turned its face to me as if deciding what course of direct action was called for. Looking up at that moment, I noticed that the security camera above me was starting to blink as if it was communicating with the alien. 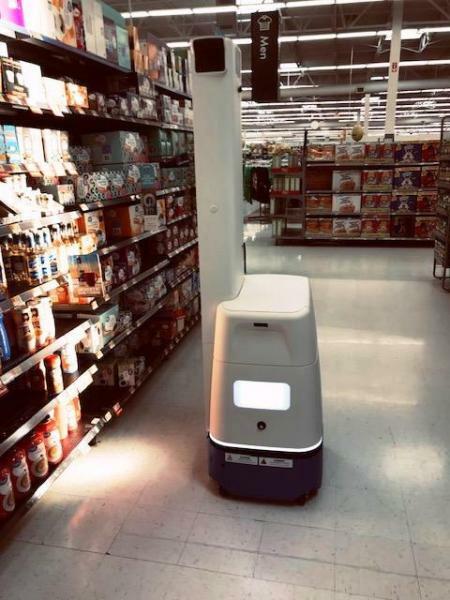 What if the invasion had already taken place and this Walmart had bee overrun by robot intelligence? Not wanting to wait around for either more aliens to show up or store security forces, I quickly boogied down the center aisle to checkout. "Mary, you will never believe what happen on Aisle 6 with the soup cans!" I blurted out. Looking at me again with that look, she quickly answered, "I don't have time for your Walmart adventures. Just get in line and check out. I want to get home before dark. As she stood in the check out line, I slowly turned to look behind me. Nothing. N o calls of help from scared shoppers or sounds of ray guns going off. Maybe I was safe. "It scanned you. Does it know about the government's facial recognition research? Maybe it was the government."